“What an adult scientist is, is simply a kid who never grew up.” Dr. Tyson explained that children have an inherent interest in science (examples such as observing “fluid dynamics” by watching a spilled cup, how a crater is formed by jumping in a mud puddle, or even learning about the material science of “embryotic biology” and how one thing becomes another by seeing a cracked egg. In other words, don’t deny your children the experiences by saying “no” and keeping everything clean, but to use those moments as teaching opportunities to allow your kids to maintain their interest in science through experimentation. The value of learning isn’t about what you know, but how you think. Who are the problem solvers? What is the value of having someone that knows how to think? Because you need to know how to think so you can solve problems you’ve never seen before. Brilliant. The school system is heavily-invested in multiple choice exams, so the brain isn’t doing work because answers are preselected. The brain is being wired to have choices instead of being trained to have an original thought. While they’re easier to grade, it doesn’t mean it’s the best way to train someone. Grades are irrelevant in the working world. The true value is are you a problem solver? A great leader? An innovator? Are you a good listener? The relativity of wrong: Exams don’t always capture the nuances of life. As an example, spelling “cat” as K-A-T is not as wrong as spelling it as X-Q-W. Why? In a dictionary, the phonetic spelling is “kat,” which some could argue is more correct than spelling it as C-A-T, yet it’s marked equally as wrong. Art and creativity is just as important to learning as science and fact. 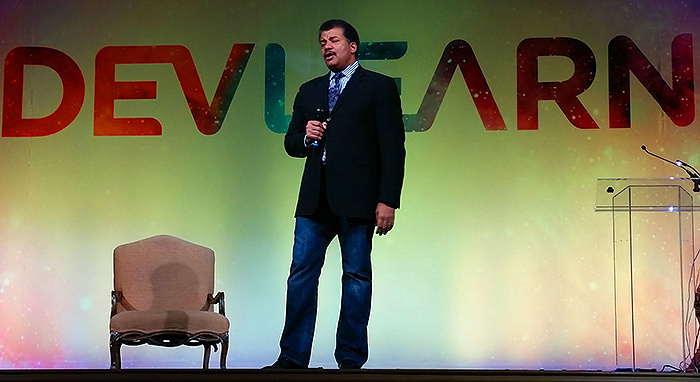 As an example, Dr. Tyson compares Harvard with MIT. At MIT, 80% of classes are in science and engineering while at Harvard, half of his classes were not related to science. Taking this into consideration, Harvard has had 61 Nobel Prize winners in science while MIT has had 29. Why the disparity? Because to win a Nobel Prize, you have to think like no other has thought before. Dr. Tyson asserts that it could be the immersion in all of the liberal arts curriculum at Harvard that opens the mind to ideas you’ve never had before. 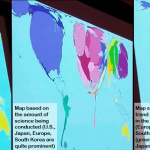 The trend of science and research is going away from the United States and expanding in Europe, Japan, South Korea, and even Brazil (see map image at right). Connecting STEM (science, technology, engineering, and mathematics) to popular culture is a way to engage people that might not otherwise take an interest. 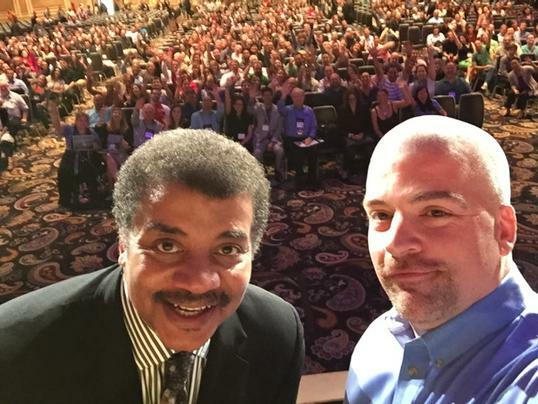 Here’s the eLearning Guild’s David Kelly taking a selfie with Dr. Tyson and 2,500 other photobombers (that’s me in the front row behind Dr. Tyson’s head in the teal shirt! ).